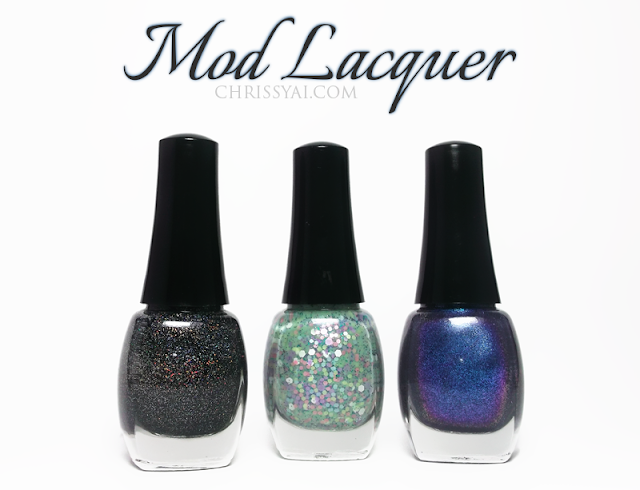 Today I introduce to you three lovely and easily applied polishes from Mod Lacquer! You can find them on Jennifer's Etsy shop (linked throughout the post) for $9.50 each! Star Seeds is a sheer black that is packed with an abundance of fine holographic glitter. I can never seem to capture polishes like this well on camera. This is so much more sparkly and eye-catching in person! I really love the combination of a black base with holographic glitter, it's so beautiful to me! Verde Montaña is described as a pale sheer green jelly base with a variety of colors and different sizes of glitter. I love how pastel this polish is, it really reminds me of Easter. I thought this was really pretty in the bottle, however I had a feeling I wouldn't like it when it came time to applying it. Much to my surprise, I did! It applied so easily, I didn't need to fish for glitter at all, it came right to me! Moonbeam is a bright cyan-like blue that shifts to into a deep purple. (As you can see happened from the center to the side of my nails) I really enjoyed how evident the color shifting in this polish is, I'm such a fan of duo-chromes! Oh my God, such beautiful nails <3 I'm a brazilian follower, but had never commented before! Those polishes are so gorgeous... Keep up the good work! You have the perfect nails. They are so beautiful. Like the colors too. wow these are really pretty. I was trying to pick a favorite, but they're all so nice in their own way! I'll have one of Moonbeam please! It's totally something I would wear! love love the second one!! like you said, definitely perfect for Easter.